The Bluestack Micro Plus Board, supports DVMEGA raspberrypi-boards(not included) both dual and singleband. With the BlueDV app, you have access to DMR, D-star (REF, XRF, DCS) and now Yaesu System Fusion support!! Firmware to be used for this mode is Version 3.07 beta - DVMEGA Firmware may need to be updated. switch activated (in) - serial mode for G4KLX mode, MMDVM, BlueDV for Windows, or DVMEGA firmware upgrade mode via X-loader tool. note: new units will be switching off programming-mode after 1 minute. This is for MMDVM-mode. Older units; diconnect the wire on radioboard after upgrade. switch de-acivated (out) - BlueDV mode, connecting to BlueDV App. BlueDV is an Android app, so perfect to use as mobile hotspot!! Unit is always powered through the micro-usb, so use an adaptor or a battery-pack to power, or just power via the PC/USB-hub. 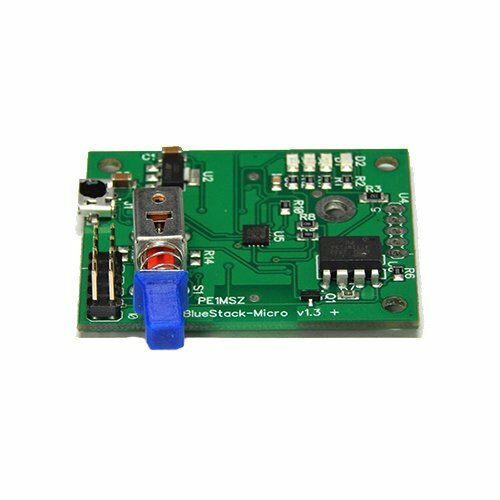 The Bluestack Micro Plus Board, supports DVMEGA RPI radio boards(not included) both dual and single band. With the BlueDV app, you have access to DMR, D-star (REF, XRF, DCS) and now Yaesu System Fusion support!! The usb-connector is a power-connection only! View More In Fixed-mount CB Radios. If you have any questions about this product by BlueStack, contact us by completing and submitting the form below. If you are looking for a specif part number, please include it with your message.